Working from home has been made easier with the availability of high-speed internet and the free video-conferencing service like Skype. Even thought the India has growing economy, people prefer to work with remote jobs or want to start their own business from home. Career fields like Marketing, Freelancing, Tutoring and Medical health has more work from home opportunities that would let the people perform the tasks from their home office. So, you never have to leave your living room to make a steady income. Just you need to find the exact job that can give benefits to your qualification, skills and time. If you are from the metropolitan city, Delhi, you can see that there are a lot of top companies offering work from home job opportunities for people and all the latest work from home job opportunities in Delhi can be found on JobTonic.in. Not only through companies, the people of national capital make good wealth by providing their services like writing, teaching, designing etc. 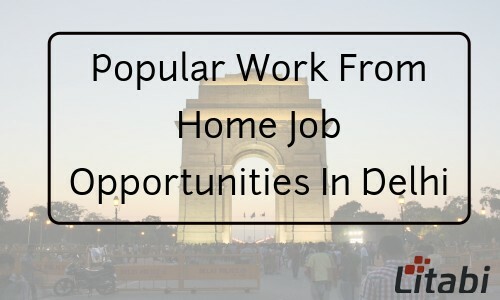 Thus, in this post, I would like to discuss some of the popular home based jobs among Delhiites. Check the famous work from home job opportunities in Delhi! Digital has changed the way we communicate and the digital marketing has surpassed the traditional marketing methods. I hope that you have heard about digital marketing and yes, SEO (Search Engine Optimization), SMO (Social Media Optimization) and SEM (Search Engine Marketing) are its three main modules. People in Delhi seem to have great skills in content marketing, Email marketing, Social media marketing and thus they are playing the leading roles like Director, Manager and Executive in the Digital Marketing Field. So, if you are from the capital city with exceptional qualities like hands-on digital work experience, commercial awareness, social media and marketing experience, you are more likely to make a decent income through work from home digital marketing jobs in Delhi. If you wish to get a job in this field and not having any experience, you may undertake certification program in Digital marketing where you’ll learn to design the online marketing strategies & Pay Per Click campaigns, ethical ways to do SEO, essentials of mobile & social media marketing, new Google algorithm updates, Web analytics etc. Just check the Digital marketing growth analyzed by the experts! I would say that the Delhiites have exceptional creative skills and thus they show the keen interest to start their freelance career. Most of the professionals in the capital city are taking benefit of the freelancing job as an opportune way to do what they love. I have been in the online world since 2007 and I came across many creative graphic designers, content writers, bloggers & vloggers, web developers and internet marketers from Delhi. Not only professionals, the students and homemakers across Delhi are making a comfortable living with the work from home freelance jobs. Most of the businesses prefer to hire freelancers on contract basis thus the freelancing jobs are getting popular in the metropolitan cities of India. Some proficient people in Delhi had quit their 9-5 job as they have the ability to make huge income with their freelance job than their monthly salary. Through the popular freelancing websites like Freelance, Elance and Odesk, they are performing all types of home based jobs like web designing, logo & banner creating, App developing, software designing and much more to meet the monetary benefits. If you still doubt my words, you may check this TimesofIndia post on Freelancers! The capital of India, Delhi has seen an extraordinary development in the call center industry. The flexibility of work from home has made people opt for this kind of kind of phone-based job. The giant companies around the world are hiring several professionals from Delhi as technical support agents to get their support to do troubleshooting the software. The cost of hiring the professionals from the developed countries like UK and US is comparatively high and thus I would say the Delhi has become the hub of outsourcing the business processes. Those who are working in home based call center in Delhi have complete technical requirements at their home like PC, Broadband internet connection with a landline phone and printer. If you want to get a work from home call centre job, you should be aware of the genuineness of the company which you’re gonna work as there exist a lot of fake call centers in Delhi-NCR region! Along with the above popular work from home job opportunities, the educated Delhi folks are making money with online tutoring, data entry/typing, Ad posting, Medical Transcription jobs and part-time real estate jobs. Most of the people wish to set up their office at home! Especially, the people from the metro cities of India like Delhi prefer to work from home to have a great suppleness and to cut the travel time & expenses. Moreover, they hate to work under the bosses and thus making a peaceful living through online jobs. The three home based jobs that I’ve discussed above are getting famous among Delhiites as they like the idea of being the own boss. Moreover, they are defining their own hours to work and spending more time with the family. Do you agree with my views of work from home job opportunities in Delhi? Share your thoughts in the comment section. How To Modify Your Voice? Use Voice Changer Tool!